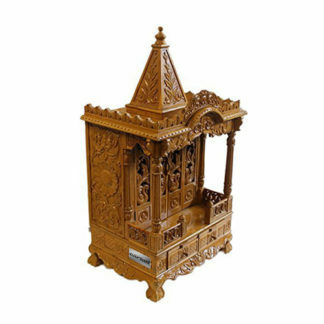 Aarsun Wooden Temple for Home and Offices carefully handcrafted by skilled artisans. The Wooden Mandir plays a vital role in instilling peace as well as serenity to our homes. This specific Wooden Mandir has 3 major parts. Very Strong: Teak wood is a hardwood obtained from broad leaved deciduous trees, and it is exceptionally strong. Moisture Resistance: Sagwan Wood Temple has a good resistance to moisture and water. Termite Resistance: Sagwan wood has a natural oil content that resists termites (white ants), fungal stains, and also repels other insects that can destroy the wood . High Dimensional Stability: Sagwan wood does not warp or shrink as compared to other wood materials.